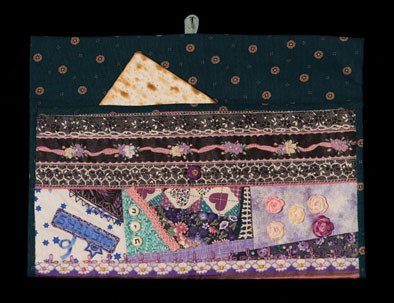 Lillian Goldberg used a crazy quilt pattern to make this afikomen bag. The bag is used in the Passover celebration, which commemorates the Jewish liberation from Egyptian slavery. During the traditional ceremonial dinner known as the seder, matzo (unleavened bread) is served. It is customary to break off a piece of matzo and hide it somewhere in the house. The hidden piece of matzo is known as the afikomen and the child that finds it receives a reward. The hunt and prize keeps children interested and awake during the seder, a very long meal.